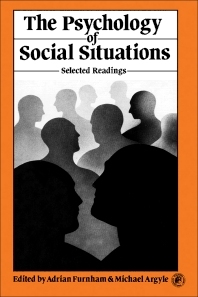 The Psychology of Social Situations: Selected Readings focuses on the situations in which social behavior occurs, taking into consideration the effects of these situations on different forms of social behavior. The selection first discusses the structure of social situations, including the structural elements of games and scenes of social interaction. Topics include paradigm for the analysis of the components and dimensions of scenes and the components, dimensions, and behavioral consequences of scenes. The publication also reviews studies on behavioral appropriateness and situational constraint as dimensions of social behavior; the use of free-response description approach for the analysis of person-situation interaction; and goal structure of situations. The book examines situational dimensions, perceived dimensions of interpersonal relations, and psychological effects of social environments. The text also ponders on the trait-situation controversy and the concept of interaction, person-situation interactions, and personality measurement. The selection is a dependable reference for psychologists and social scientists. 3. Similar Situations • Similar Behaviors? 3. Anxiety: States, Traits - Situations?